It’s been referred to as “Summer Camp for Car Folks” or “The Anti-Douchebag Rally” for good reason, it feels very much like both of those things. This is the fourth Coastal Range Rally hosted by my friends at DWA!, and the third such rally I’ve attended. CRR North is the first of these to have taken place to the north of San Francisco, as the other three have run south from SF to LA. This time we’ve stabbed northward into the Free State of Jefferson and would like to avoid running afoul of vigilante locals. Through desolate forests, across wide open plains, up and down volcanic mountains, and finally spit out into the coastal redwoods, the rally route is an incredible journey in and of itself. Crafted in a similar vein to the one-make club driving days or vintage enthusiast rallies, the Coastal Range was created because its progenitors had their own cars denied from those snootier events. A vintage car rally won’t accept a lowly 944 based on age or prejudice, similarly Miatas, E30s, various watercooled Volkswagens would be excluded. If you want to have a fun time, you invite the misfits. They represent the grassroots car fanatics with a passion for analog automotive driving experiences. These are the guys who passionately argue the case for manually-shifted transmissions, who desire to drive unimpeded by the aid of computer controlled chassis dynamics, who yearn for the days of DIY. The route this time ran from Oroville, CA to Fortuna, CA by way of Redding. If you take the fastest route, that’s a simple five hour drive, just 258 miles all told. With three solid days of back roads driving ahead of us, following the route book as closely as we could, our mileage more than tripled and thanks to the switchbacks our average speed was much lower than what you might accomplish taking The 5. Exquisite runs through Plumas, Lassen, and Mendocino national forests made for some of the most beautiful photo opportunities, as did a stop on the shores of Lake Almanor. 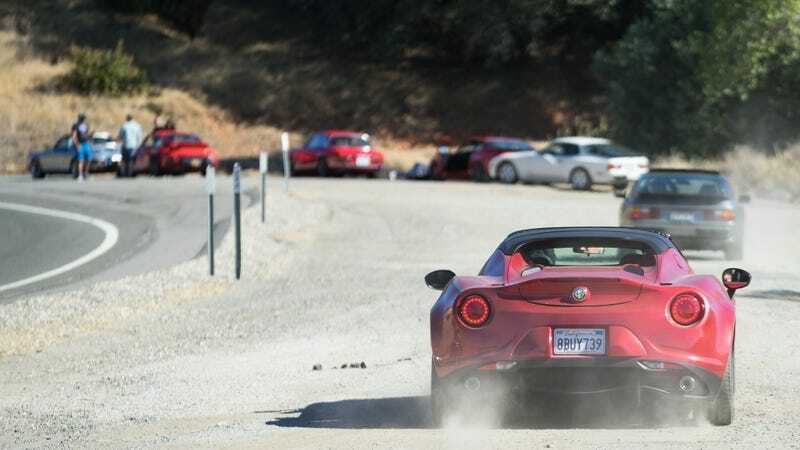 Speed isn’t the object of a Coastal Range Rally, though it can occasionally be a factor. Over four events, the organizers report just one law enforcement infraction for tail light bulbs being too dim. This isn’t the kind of event you might picture when I say “Rally”. This isn’t the gold foil wrapped GT-R, strip clubs until all hours of the night, debauchery and depravity kind of event, it’s a responsible tour on amazing roads with excellent company. We occasionally trade keys to experience the eclectic rides of others, we place more emphasis on thick tire sidewall than lateral acceleration, and we will occasionally take the dirt road if one is offered to us. The packs of cars bunch up and expand in time with the exhaust note music, with speed ranging from brand-new 911 Turbo S on down to a Herbie the Love Bug replica. With such a disparate group, it becomes pretty easy to find a few people running at a pace you and your car are comfortable with. There are frequent regrouping stops, at least four times a day, that allow us all to stay somewhat close to each other. Everyone stops in the same towns for lunch, and everyone stops at the same large roadside dirt pullouts with exquisite vistas. This event is as much about camaraderie as it is about the cars. Running in packs helps, as sometimes a thousand hard bumpy miles in an old car is liable to cause issues to crop up. A low-mile Audi 200 lost its turbocharger, a 914’s engine made its internals external, a 997 GT3 broke a sway bar end link, a V8-swapped Volvo cracked one of its alloys, and two cars had tire punctures—my 944 Turbo and the Lancia Delta Integrale. Life is not without misfortune, and life with an old car perhaps moreso. Despite our best efforts, we didn’t ever actually get lost. The 944 Turbo served quite well, aside from that leaking tire which we patched in a parking lot, in spite of its sky high odometer reading. There was a high contingent of transaxle Porsches, the O.G. misfits, including three 944 Turbos, three naturally aspirated, a trio of 928s, and a lone 924. They all made the trip without so much as a hiccup. With neutral handling, great weight balance, and incredible power and tractability, that 944 Turbo may have been the perfect car for such an adventure. Here is a video from one of the folks on the rally to give you a better idea of the vibe of the event. My co-driver and I met a lot of cool people, spent time with old friends, and had an adventure getting to know new terrain. With the two Coastal Range Rally events—South in February and North in September—offering such different terrain from each other, I’m glad I attended both this year. If you can make it out, I highly recommend it.